This Solid Globe includes selected quotations from Shakespeare and wood engravings by Jane Lydbury printed by Camberwell Press in 1984. The binding, bound by Eduardo Giménez, is covered in black calfskin with dyed maple veneer onlays. The wood veneer letters are inset into the shape an “O” around the central veneer planks. A blue suede is used for the doublures and flyleaves. In 2013, your entry to the Designer Bookbinders International Competition was awarded second prize and acquired by the Getty Collection at Wormsley. The binding is another beautiful example showcasing wood veneer. In this binding, you’ve dyed the maple veneer onlays. What method are you using to dye the veneer? The binding process was very interesting. The idea of the design was already in a first rough sketch, but actually, when I start a work I hardly ever know very well how it will end up. And that gives me a certain margin for improvisation. And in these decisions that I’m taking along the way, the senses play a natural role, especially the visual aspect, which pursues maximum beauty for the eyes, a nice touch for the hands, or, even, the smell that comes from the materials such as the leather, the marbled and hand painted papers, or the wood. 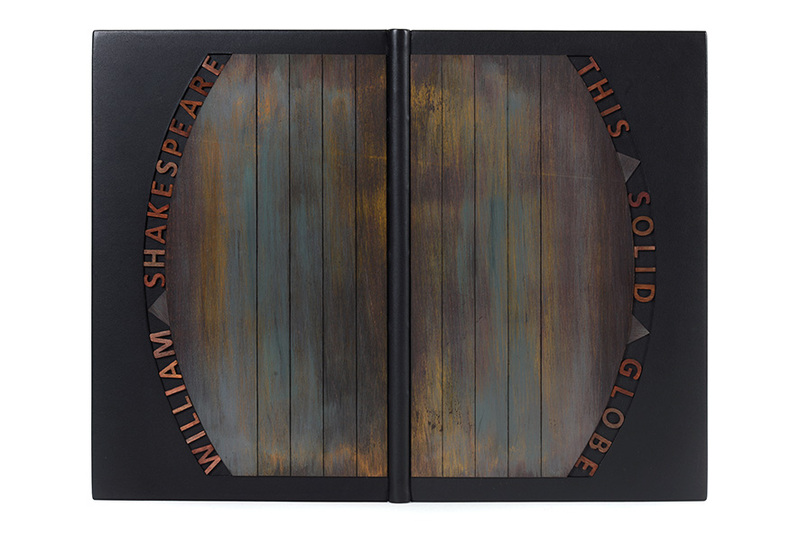 And so the colours and reliefs of the Shakespeare covers started to emerge gradually as I was working in the binding. In fact, the central element of the decoration was wood, a light maple wood. I applied some first aniline dye layers to give it a soft background color. Later I went on adding very thin layers of acrylics of different colors in different areas, in a somewhat random manner. After each coat I let it dry for some hours and used a very fine sandpaper, also on some areas. This process lasted several days but with no appealing results. But then, one day, approximately after about twenty layers, I sanded all the surface again, and a very rich palette of colours appeared, without losing the texture of wood. My Shakespeare was there! I only had to add a bit of wax and burnish it in order to obtain a surface slightly gloss finished like the black calfskin of the cover. The lettering for the title and author are cut with such precision. Do you hand cut your veneer? All the pieces of wood that I have used in my bindings were cut by hand, except the letters of Water which are cut with laser. And in all cases there is also a further process of very thorough dyeing, as the one I have described.